I write with great admiration and appreciation of your remarkable philanthropic efforts on behalf of health, poverty and education. Changing the world is a spectacular goal. Congratulations on your plans to dedicate more of your time to charity and on Warren Buffett’s enormous contribution to the Bill and Melinda Gates Foundation’s efforts. I know nothing about infectious diseases, vaccines or sustainable agriculture. I defer to you and other experts on those topics. A recent Business Week cover story, Bill Gates Gets Schooled, was eye opening. That article reports the mixed success of your foundation’s efforts in public school reform and your candid admission of disappointing results. It must be depressing to spend a billion dollars on school reform and all you got was a lousy t-shirt. I humbly share the following recommendations to help guide your future initiatives. You and all your advisors should read Seymour Sarason’s book, What Do YOU Mean by Learning? Sarason makes what should be an obvious observation that discussions of learning, teaching and school reform often fail to discuss what the stakeholders mean by learning. Without such a serious ongoing discussion, failure is predictable. With all due respect, the Gates Foundation needs to decide what it means by learning and stop funding competing organizations. Investing in the Met Schools (see “Radical Reformer,” November 2005, page 46) and Achieve, Inc., simultaneously is like funding both sides of a war. The Business Week article tells the story of a Denver High School that received Gates Foundation funds. The school was broken up into four smaller schools in an attempt to make schooling more personal and have fewer students fall through the cracks. However, the school’s award-winning choir, a perennial source of pride and excellence, crumbled when students were dispersed to four different schools within the building. Surely, some smart adult could have figured out a plan to move children from one corner of a school to another for choir practice? It must be depressing to spend a billion dollars on school reform and all you got was a lousy t-shirt. A recent Los Angeles Times article chronicled how the noble goal of breaking large high schools into small, more personal, learning communities does foster school pride. However, it also may cause those communities to become tribes hostile to one another and result in limited elective options for students. This is my axiom to explain the chaotic nature of schools. It may indeed be easier to build a residential campus in Paris for New York City ninth graders than to hire a French teacher for their neighborhood school. Stop talking about schools as businesses and using terms like efficiency, productivity, supply chain and measurable outcomes. Such metaphors are weak and create needless tension among your “partners” in education. The clich?s used by educators to describe their practices and objectives can prove just as stifling and counterproductive as business metaphors. Reflexive mantras like “Sage on the stage” and “You must invest in professional development” fail to acknowledge the complexities of education and provide alibis for failure. Such short-term language may be appropriate for quarterly profit statements, but not education. Learning is messy, individual and natural. Schools do not manufacture widgets, but create an environment in which children and teachers may grow. If you do wish to focus on results, be honest about what works. Education is notorious for having ideology trump evidence. Your talk of “more rigorous curriculum” and scores directly contradicts research funded by your foundation. The Met/Big Picture schools are wildly successful despite the complete absence of any traditional notion of curriculum. If you want results, build a lot more schools like the Met and let go of the fantasy of one-size-fits-all magical curricula. If you pay the bills, then you have a right and responsibility to run the school. A hands-off approach to schools you fund creates confusion among the stakeholders. Your support, insight, expertise and clear expectations must be apparent and consistent. You have acknowledged that it is easier and more effective to build new schools than fix some existing ones. Keep creating great schools where children can flourish and building models others can follow. If you find that preparing poor, urban, rural and minority students for college is too difficult, then build some colleges with open enrollment in those communities to offer opportunities students would otherwise be deprived of. Almost nothing done in the past 50 years has helped students be more numerate. Work with Seymour Papert to invent a mathematics curricula that students could love, rather than coming up with tricks to help a few more memorize algorithms irrelevant to their lives and the complex world in which they learn. Computers have a clear role to play in learning about such sciences of complexity. You are the richest man in the world. That’s like having tenure. You may work without fear! You and Oprah spent two hours on television alerting the public that too many schools are failing too many children. However, you seem reluctant to discuss the underlying causes of poverty, inequitable funding formulas and the resegregation of our nation’s public schools. The Gates-funded Manual Arts High School in Denver that has now closed was destroyed by the resegregation of the school. Civil rights are critical for students and you need to lend your voice to that struggle. Education Secretary Margaret Spellings likes to say, “Schools are the same as they were 25 years ago.” That is demonstrably false. I graduated high school 25 years ago and enjoyed a full-range of electives, three music classes per day, great bands, fabulous plays, no AP courses, little tracking and teachers did not soil themselves over the need to raise scores on deeply flawed standardized tests. The climate of fear, name-calling and punishment paralyzing schools today is a recent phenomena produced by those professing to help. We will have achieved success when all schools are demonstrably great places where children prefer to be and authentic learning exceeds our expectations. I wish you well in your quest to create such a reality. I have eagerly anticipated Diane Ravitch’s new book, The Death and Life of the Great American School System: How Testing and Choice Are Undermining Education , for many months. I’ve recommended the book in this blog and at conferences since my copy arrived a few days ago. I remain excited that a noted education historian is openly criticizing the pandemic of standardized testing, union-busting, teacher-bashing, charter school expansion and heavy-handed policies being driven by political ideologues and corporate profiteers. Diane Ravitch can teach us a lot about school governance, policy and the history of public education. Just don’t expect to learn much about learning from her new book. Admittedly, I have only skimmed the book, but it is not hard to find evidence that Dr. Ravitch has not left all of her highly conservative views behind. She blames the familiar bogeymen of the religious right for many of the problems in American public education, notably constructivism and whole language with the selective citing of easily refuted research. Her naive understanding of learning theory or learner-centered pedagogy is like that of a teacher education student or mom who just returned home from a “Tea Party” rally. Ravitch dismisses research conducted by noted scholars Lauren Resnick and Richard Ellmore and seems to present the case that Anthony Alvarado is one of the villains whose embrace of balanced literacy (HARDLY a progressive idea) and “constructivist math” (oooh booga-booga) led to the destruction of public education. This assertion is not only wrong, but ignores the fact that Dr. Alvarado led many of the pioneering efforts in urban education including the “small schools” movement that resulted in the highly successful Central Park East Schools started by Ravitch’s colleague, Deborah Meier. Calling the reign of San Diego Superintendent and former prosecutor, Alan Bersin “left-wing” is laughable to anyone with the slightest awareness of his heavy-handed leadership style. Ravitch seems to revere A Nation at Risk as gospel created by divine intervention, not the Reagan administration and caricatures efforts of the 60s and 70s to make classrooms more democratic, creative and child-centered. She remains a proponent of national curricula, a patently absurd solution in search of a problem. That said, I will read the rest of the book and share my thoughts as warranted. I just felt it was my obligation to warn my friends and colleagues that although I recommend The Death and Life of the Great American School System: How Testing and Choice Are Undermining Education, you should read it with a fresh new battery in your BS detector. Education historian and former Assistant Secretary of Education for the first President Bush, Diane Ravitch has just published an extraordinary book, The Death and Life of the Great American School System: How Testing and Choice Are Undermining Education. The book should be required reading for every policy-maker, citizen and educator. The extraordinary reporting found in the book can not help but convince Americans that their public education system is endangered by the politicians, billionaire mischief-makers, foundations and business groups professing to “fix” the “broken” system. Similar accusations have been leveled before in books by Alfie Kohn, Susan Ohanian, Gerald Bracey, Herb Kohl, Jonathan Kozol, Deborah Meier, Linda Darling-Hammond and others. What makes this book so extraordinary is that it was written by a proponent of many of the reforms Ravitch herself now admits are destroying public education. That’s right, Dr. Ravitch is the rare scholar/leader who when confronted by the actual application of theory is capable of rethinking her assumptions. Ravitch has also severed ties to many of the conservative think-tanks with whom she no longer shares similar views and has had the courage to expose her change-of-heart and mind publicly in this book and in the spectacular blog, Bridging Differences, she writes with (CMK 2010 guest speaker) Deborah Meier. Ravitch challenges the current fetishes of merit pay, mayoral control, charter schools, vouchers and standardized testing while also questioning the statistical plausibility of the test score miracles being touted by politicians like Arne Duncan and NYC Mayor Bloomberg. At the same time, Ravitch advocates a national curriculum (albeit a richer one than proposed), an idea I find extremely troublesome. Without sentimentality, Ravitch’s new book is a love letter to public education and the democratic ideals it fosters. The story of personal transformation late in life is generating an unprecedented level of publicity for a book about education. I am most grateful to Dr. Ravitch for placing these issues at the center of mainstream media debate for the first time. I intend to write something substantive about the book once I have an adequate chance to digest it. In the meantime, I recommend you read the following reviews of the book. They Hate Me, They Really Really Hate Me! Kevin Carey, of the “independent” and “innovative” Education Sector, didn’t have the decency to defame me by name when he attacked the cover story, School Wars, I wrote for the current issue of Good Magazine. 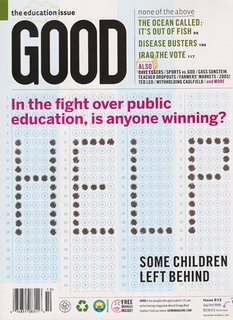 In a time when smart people of good faith occupy both sides of many heated and complex education debates, it makes sense occasionally to pause, take a deep breath, and denounce things like the incoherent mishmash of policy juvenalia, useless sentiment, and blatant lies found in this article, published by GOOD Magazine, in which we are told that NCLB “requires all of the nation’s schoolchildren to be above the mean on standardized tests,” Bill Gates and Eli Broad are spearheading the corporate conspiracy to privatize K-12 education, and standardized tests come with instructions about what to do if students throw up on them. It’s sort of a perfect distillation of woolly-minded HuffPost-type conventional education wisdom, and in that sense is oddly valuable, because you can read it and know everything that a not-inconsequential percentage of people know (or rather, don’t know) about education. It’s not “useless sentiment” to care about children. Ever since President Bush told me to “use the Google,” I have found it to be an indispensable tool for learning all sorts of interesting things. One thing I learned when I clicked on the “Who We Are” link on the Education Sector web site was that the “independent” and “innovative” Education Sector is funded by the Bill and Melinda Gates Foundation, as well as Eli Broad. It is awfully refreshing to see such “independent” and “innovative” analysts strenuously defending their sugar daddies. It’s kind of sweet. 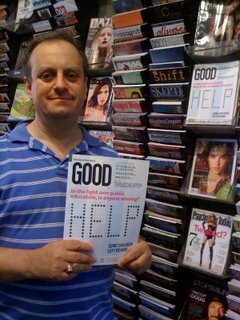 For the record, my article was carefully fact-checked by Good Magazine. In fact, a good deal of my juiciest stuff about Eli Broad was left on the cutting-room floor. Stay tuned, keep reading and don’t forget to follow the money! Note: You may read the Quick and the Ed attack on my article here. Note: I wrote the article below two years ago. In light of Eli Broad’s takeover of the United States government and Kanye West’s latest outrage, I thought it was worth another look. It’s just too bad that Barack Obama is willing to take policy advice from the friend of a jackass. Bill Gates and Eli Broad can’t revolutionize public education alone. They need a posse. Realizing that they needed to appeal to more than billionaires and ex-Governors Ed in ’08 teamed up with another education policy expert, rapper Kanye West. You may have heard by now that bad boy billionaires, Bill Gates and Eli Broad, are kicking it together. 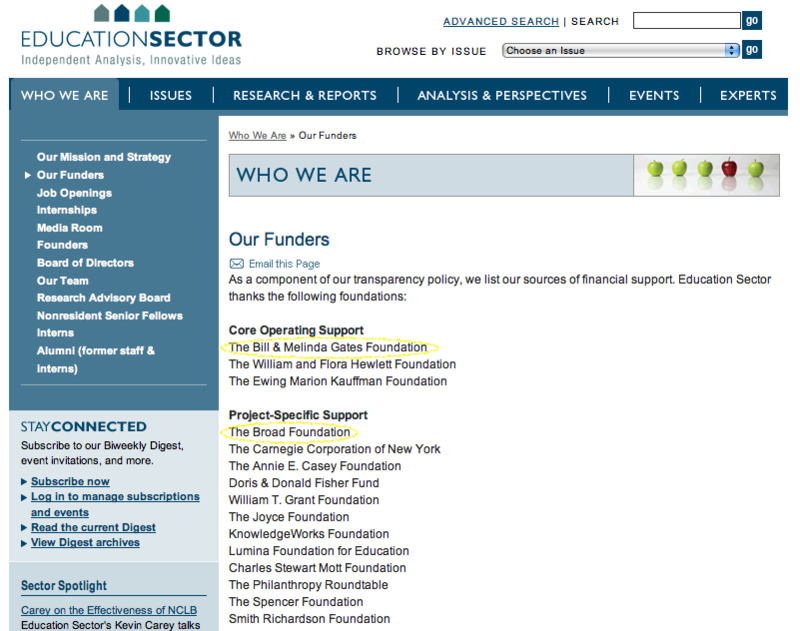 They invested $60 million (lunch money) in the Strong American Schools Project, also known as ED in ’08. They hope that this charitable non-profit organization “will catapult the need for improved public education to the top of the 2008 presidential candidates’ agendas.”(Heszenhorn, 2007) One can hardly criticize an effort to get presidential candidates discussing critical education issues, but it is unclear if Gates and Broad should be steering the agenda. It is disingenuous that Gates and Broad are investing $60 million just to inspire spirited debate. Gates and Broad have very specific educational beliefs and track records in American schools. Gates pushes small schools while Broad is much more pernicious in the way he spends money to influence urban education policy. “He says urban public schools are failing and must adopt methods from business to succeed, such as competition, accountability based on “measurables,” and unhampered management authority—all focusing on the bottom line of student achievement, as measured by standardized tests. These efforts can have a negative impact on the quality of education they hope to improve. In the new book, Letters to a Young Teacher, Jonathan Kozol points out how the small school movement is exacerbating school segregation and suggests that Gates spend his money offering incentives for suburban districts to welcome urban students, complete with transportation. (Kozol, 2007) Classroom teachers and school administrators know well how the calls for business models, accountability and standardized testing has turned schools too many schools into joyless sweatshops. Does Mr. Broad really want schools run with the virtues found in real estate development, the field where he made his money? How much low-income housing has Broad built? Real estate quality has as much to do with school quality as any other factor. Have Broad’s companies received tax abatements as incentives for development? If so, that money comes directly out of the tax base funding public schools. Politicians are already programmed to say, “We need to pay teachers more, but hold them accountable.” They say that in their sleep. Gates and Broad are already victorious, except for privatizing public schools. Gates and Broad can’t revolutionize public education alone. They need a posse. Who better to hire to direct their efforts than Governor Roy Romer? Romer was so effective as the Superintendent of the Los Angeles Unified School District that upon his retirement the district replaced him with someone possessing no qualifications whatsoever. I guess we f**kin’ then. and you mix them emotions with tequilla. on one of them bad nights. and you talkin’ bout her family her aunts and sh#t. You know, domestic drama and sh@t.
I’ll never hit a girl, but I’ll shake the sh&t outta’ you. But imma’ be the bigger man. “Sunday night I watched Kanye West’s killer performance on the MTV video music awards, and now I’m watching the number of views climb for his new public service announcement for us here at the ED in 08 campaign. That Kanye West is quite the role model. Wow! We educators sure are lucky to have an infantile, petulant and misogynistic rapper on our team. I guess that’s how Gates and Broad roll. I guess the best we can hope for is that Gates, Broad and West will pop a cap in TAKS scores. Put your hands in the air and wave ‘em like you just don’t care! Sidebar: Read what Diane Ravitch, member of the Koret Task Force of the Hoover Institute and former Reagan Asst. Secretary of Education has to say about The Broad Prize. Education_Sector. (2007). Schwarzenegger speaks. Schwarzenegger speaks. Retrieved May 4, 2007, from http://www.quickanded.com/2007/05/schwarzenneger-speaks.html. Heszenhorn, D. M. (2007, 4/25/07). Billionaires start $60 million schools effort. New York Times, p. 21. Kozol, J. (2007). Letters to a young teacher. NY: Crown. Mcintosh, D. (2007). Schools “Broad” Agenda. Schools “Broad” Agenda. Retrieved 32.26, from http://www.wweek.com/editorial/3226/7507/.